The Quest for the Time Bird There are 4 products. Poster in color that shows the main characters of the series: La Quête de l'Oiseau du Temps (The Quest For The Time Bird) by Régis Loisel and Serge Le Tendre. Published by Dargaud. Is printed on a Fedrigoni Stucco Old Mill 250g paper. 50x25cm. Poster in color that shows the main characters of the series: La Quête de l'Oiseau du Temps (The Quest For The Time Bird) by Régis Loisel and Serge Le Tendre. Published by Dargaud. Is printed on a Fedrigoni Stucco Old Mill 250g paper. 100x50cm. 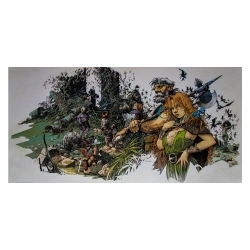 Poster in color that shows the main characters of the series: La Quête de l'Oiseau du Temps (The Quest For The Time Bird) by Régis Loisel and Serge Le Tendre. Published by Dargaud. Is printed on a Fedrigoni Stucco Old Mill 250g paper. 100x50cm. 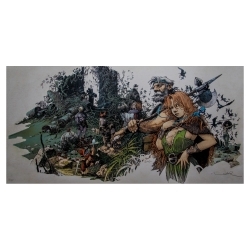 Limited edition and numbered 399 copies, hand signed by Régis Loisel. 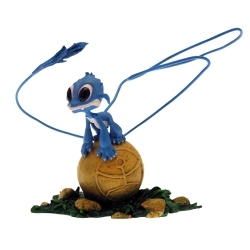 Collectible Figure Attakus The Quest for the Time-Bird: The Fourreux. Limited edition and numbered 1500 copies with certificate of authenticity.